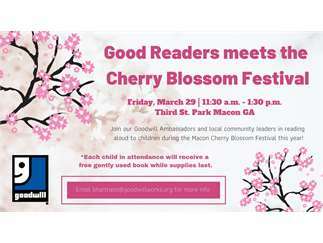 Join Goodwill Ambassadors at the Macon Cherry Blossom Festival Friday, March 29 from 11:30 a.m. - 1:30 p.m. in the Third St. Park in Macon. Goodwill Ambassadors and local community leaders will read aloud to children during the festival. Each child in attendance will receive a free gently used book while supplies last. For more informaiton, email bhartness@goodwillworks.org.